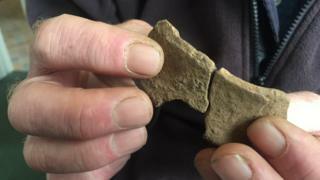 Archaeologists say they have unearthed the remains of a so-called incense pot at the Ness of Brodgar in Orkney. It is only the fifth one of its type discovered in the British Isles. Other examples have been found near Stonehenge and in Dorset. Site director Nick Card told BBC Radio Orkney that the pieces might not look like much, but were in fact "very exciting". It was discovered by a volunteer working at the dig. The identification was confirmed by Claire Copper, who has recently an MPhil at the University of Bradford, and her supervisor Dr Alex Gibson. Mr Card said the name incense pot was invented by Victorian antiquaries. He added: "It was thought that the design would have been perfect for holding incense, perhaps in ceremonies. But recently analysis of the residues [in the pots] has really been inconclusive. "Other people have suggested that they were perhaps special cups, designed for maybe carrying the embers of fires for cremations." The pots seem to be associated with the disposal of bodies - either burials, or cremations. Earlier this week Neolithic markings carved into a stone at the site were discovered by chance, after being missed by archaeologists for years. The faintly incised butterfly-like motifs were revealed as sunlight lit up the rock, leading experts to say that there were perhaps deliberately made to catch the light at certain times of day. Since 2002, Neolithic buildings, artwork, pottery, animal bones and stone tools have been discovered at Ness of Brodgar, near the Ring of Brodgar standing stones. The dig is being led by the University of the Highlands and Islands Archaeology Institute and supported by Ness of Brodgar Trust.